Sparks? No. Talking Heads? No. Queen? No. Bowie? Killers? Martha & the Muffins? Franz Ferdinand? Television? No. No. No. No. No. 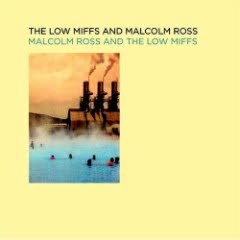 The Low Miffs and Malcolm Ross? Of course! Aztec Camera, well only a bit. That bit being the addition of Malcolm Ross, formerly of the Aztecs (as well as Orange Juice, a band I'd desperately like to forget but keep running into) to The Low Miffs for a brand new release. The Low Miffs are a Glasgow band in the same vein as Franz Ferdinand (who happen to be some of the Miffs' biggest fans), pop tunesters with a keen ear for unique hooks to blend with familiar sounds and styles. All of that gives you a band that sounds fresh and new, while at the same time sounding for all the world like Sparks, as they do on "Cressida" or bringing to mind Queen like on "Dear Josephine". Meanwhile, this new video showcases the big, bold voice of Leo Condie, all the while echoing The Killers in sound and style.